If you read my post about the cute $7 crockpot that I saw on sale last week, this recipe would be the perfect fit for it! If you have a “little dipper” sized crock pot, you can make this dip and then use the crock pot to serve it and keep it warm. I thought these flavors fused together well for an easy afternoon snack. 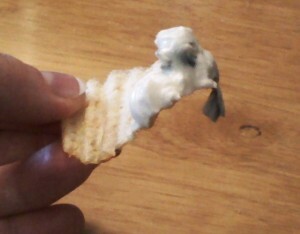 I’d recommend serving my summer onion dip with crisp pita chips, wavy potato chips, baby carrots and cut up celery. It also would be great on a baked potato! It’s a basic enough recipe that it would be great on top of pretty much anything. Enjoy! Put all ingredients in small crock pot and stir together. Heat on low for two hours.